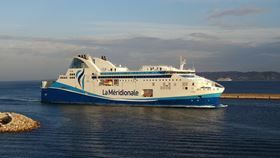 Andritz is supplying a desulfurization plant to the ferry operator La Méridionale, France. Photo: Andritz. Andritz has won orders from two shipping companies to supply SeaSOx desulfurization systems for exhaust gas cleaning. A shipping company in Belgium has ordered a SeaSOxwet scrubber for a bulk carrier operating between South America and China. The system will be designed as a spray scrubber in open-loop mode and will use seawater to clean the exhaust gas from the main engine. Andritz has also signed a cooperation agreement with the French ferry operator La Méridionale, and the Belgian chemical group Solvay to install the first Bicar® dry exhaust gas cleaning system (SeaSOXdry) worldwide on the Piana roll-on/roll-off vessel. This solution uses Bicar sodium bicarbonate as the absorbent and a pulse jet fabric filter for SO2 and particulate removal. One main engine and one auxiliary engine will be routed to the filter system. Andritz is responsible for the design, engineering, and supply of the main equipment. Both SeaSOx systems are scheduled to be installed in March 2019.